Even on a foggy morning a watching tour departs from Telegraph Cove on Northern Vancouver Island with a cargo of eager passengers. Whale watching tour boat from Telegraph Cove, Northern Vancouver Island, British Columbia, Canada. 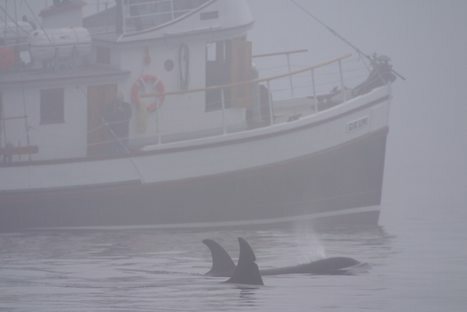 Picture of a whale watching tour boat emerging from the fog beside a pod of Killer Whales off Northern Vancouver Island.